Boys Team Trials: Saturday, April 27th 9 am – 12 pm – Welcome To Metropolitan Gymnastics! Boys Team Trials are being held on Saturday, April 27th from 9 am – 12 pm! Pre-Team, Recreational, and Open Gym athletes interested in Competitive Gymnastics may sign up at the front office (in person or by calling 425-282-5010) for either the 9-10:30 (5-8 years old) or 10:30-12:00 session (ages 9+). Athletes will be evaluated on strength, flexibility, attitude, ability to follow directions, and on their gymnastics skills and abilities. Gymnasts should come dressed in shorts and a t-shirt (no belts, buckles or zippers). Coach Karen will be hosting a Parent Information Meeting on Tuesday April 23rd at 6:00 and Thursday, April 25th at 7:00 to discuss the details of being a team gymnast. Parents will learn about practice expectations, financial and time commitments, opportunities for fundraising at this time. In addition, parents can meet Men’s Program Director PJ Chi and ask questions of current team parents and Booster Club members. Attendance is STRONGLY encouraged! If possible, please come without your athlete. There will not be child care available and the gymnasts will not be able to on equipment at that time. ← Congrats to our Men’s Regional Champions! 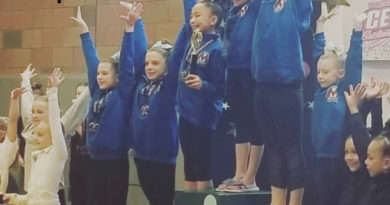 March 29, 2019 Comments Off on Compulsory Girls Shine at Central Sectionals!